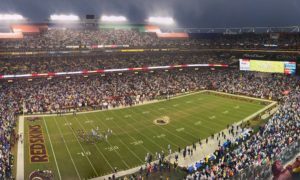 For the second week in a row the Redskins have come away from a preseason game victorious on the scoreboard but with more questions than answers stemming from the game. The biggest storyline from the game is certainly that of Quarterback Robert Griffin III and the amount of hits he took, including the final hit that saw him sustain an (apparently mild) concussion after he fumbled the ball on a very strange playcall on third and long. More on that later. Notice that he didn’t single out anyone specifically, including Griffin. Gruden is learning from his rookie season that throwing players under the bus doesn’t serve anyone’s interests except the medias, and they don’t help the team win football games. Last week we separated the post-game breakdown into ‘The Good, the Bad and the Ugly’, but then it was pointed out to me that Rich Tandler has been doing the same for a long time, and not wanting to step on his venerable toes as I consider him a friend, these breakdowns will henceforth be delineated as ‘What worked, What didn’t, What sucked’. The new-look Safety tandem of Duke Ihenacho and Dashon Goldson once again looked good during their time on the field. Both Ihenacho and Goldson were individually responsible for bringing down the ball carrier on separate occasions, with Ihenacho especially looking dangerous versus the run. Neither Safety is afraid of contact, and their physical presence was noticed versus Detroit. The front seven of the Defense also did their jobs nicely, holding Detroit’s first team offense to just 11 yards on 5 carries on the ground. Speaking of the ground game, Alfred Morris only got a couple of touches tonight before the team rested him, opting to give Matt Jones and Chris Thompson some extra work to further assess their capabilities. Both Running Backs delivered in spades, with Jones once again delivering a highlight play that a man of 231lbs has no right to be capable of as he powered through the defense for a 24 yard carry. Chris Thompson made the most of his opportunities as well, notching up 37 yards on 5 carries for a 7.4 average, buoyed by a nice 19 yard gain that showed off Thompson’s impressive agility and field vision. Thompson also showed his team tonight that he has a boat-load of hustle, too. 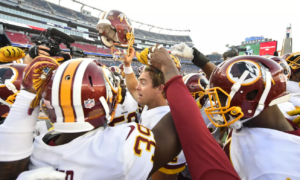 With 0:02 on the clock before half-time, the Redskins had the ball at the 1 yard line looking for a last second touchdown, opting to forgo a game-tying field goal attempt. In the rain, Colt McCoy fumbled the snap and the Lions recovered with nothing but 99 yards of open field in front of them. They looked certain to score if not for Thompson’s excellent determination, chasing down the returner and stopping him well-short of the endzone. Despite the fumble, McCoy had a good showing running with the second team, leading an 80 yard scoring drive that ended with a 19 yard touchdown pass to Reggie Bell. McCoy also moved the chains in the final 2 minutes of the half on the drive that resulted in the aforementioned fumble. Regardless, McCoy made sure that the competition to be the Redskins number two Quarterback remains firmly open. Tight End Je’Ron Hamm, who despite being the #1 healthy Tight End on the Depth Chart didn’t see many snaps with the first unit, showed that he is more than just an outside chance at making the roster. On the 24 yard Matt Jones carry, Je’Ron Hamm opened a gap with an excellent block, and he followed that good showing with a nifty 23 yard reception of his own that involved more than one defender being juked out of their approach angle. The stats don’t look pretty for Robert Griffin III, ending the night 2-from-5 passing attempts for 8 yards and 1 lost fumble. Sure, Griffin played far from perfectly, but he wasn’t responsible for the majority of the hits he took. As mentioned earlier, on 8 dropbacks he was hit 6 times. 4 of those 6 hits were a direct result of an Offensive Linesman giving up pressure. Of those 4, a whopping 3 Quarterback hits came directly through Left Tackle Willie Smith, who was starting in place of Trent Williams. The other came through Brandon Scherff. That means 2 out of the 6 hits that Griffin took were his own fault, and when you watch the tape back, really only one of those hits was a bad mistake. 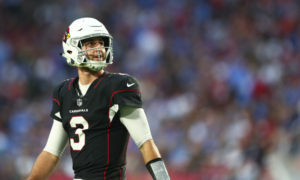 Griffin to his credit was trying to stand tall in what little pockets he had tonight, clearly wanting to demonstrate that he’s been working hard on his fundamentals as a dropback passer. But standing tall in the pocket means that if you aren’t being protected, you’re vulnerable. We saw the perfect example of that on this throw on 3rd and 6 that Andre Roberts ended up dropping. 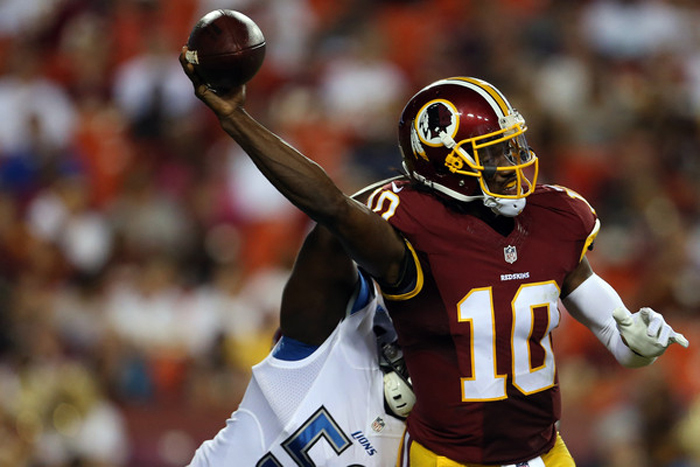 That ‘bad mistake’ hit that Robert Griffin III took? The last snap he played tonight. On a long 3rd and 16, Griffin dropped back and quickly saw Willie Smith being beaten again at Left Tackle, and also saw no receivers anywhere close to the first down markers, so he started sliding to his right. He may have even been getting ready to take off and run with the ball, but we can’t know for sure because before he could do anything, the ball fell from his hands unforced, and Griffin had to dive on the ball to attempt to recover his own fumble. In the ensuing dog pile, Griffin sustained a hit to the head that resulted in a concussion. Whilst Griffin’s fumble was bad, what is inexcusable is the play call. On 3rd and 16 sending three of your four receivers on 3 yard underneath routes is mind-boggling. As you can see in this GIF, even the Detroit defense looked shocked that the Redskins weren’t sending receivers towards the sticks. The offensive game plan that the Redskins utilized tonight was confusing at best, infuriating and incendiary at worst. When there’s already wacky conspiracy theories in the ether that Gruden is deliberately sabotaging Griffin’s development because he prefers Cousins or McCoy, leaving Griffin in a vanilla dropback offense that clearly isn’t working behind a piecemeal Offensive Line and then having Colt McCoy’s first pass play being a bootleg is simply incredulous. Speaking of wacky, pre-game when the list of inactives came out and showed Willie Smith starting in place of Trent Williams, it caused some confusion. All throughout Training Camp, either Tom Compton, Ty Nsekhe or even Takoby Cofield started at Left Tackle ahead of Willie Smith on days when Williams was rested, and all three looked better options throughout camp as well. I understand that preseason games are used by coaches to analyze which players perform under pressure, but Left Tackle is not a position where you roll the dice and leave your franchise Quarterback dangling in the wind. A strange lineup from Gruden. Brandon Scherff is a rookie playing at a position he is not used to yet. Whilst the play where he gave up the sack wasn’t great, some leeway can be extended to rookies in preseason as they learn and develop. Willie Smith, however, is a five year veteran, and he gave up pressure so often and so routinely tonight that it was absurd. It wasn’t as if he was being beaten by world-class pass rushers employing complex moves against him either. Rather, it was stock-standard stuff that made Smith look totally lost. A very poor showing that only proved just how valuable Trent Williams is to this franchise.